Once you drop below the price point of the competing HD 6950 and GTX 560 Ti, you get into the value segment. That's not value as in 'value' toilet paper – it's all about the price, and not necessarily the performance. With the HD 6870, you'd only be looking at this card if you really couldn't afford to spend a pound more than its listed price. That's not to say it's a bad card. It compares favourably with the marginally more expensive GTX 560 Ti, though when we first saw it at launch, the combination of relatively high price point (£200 at release) and older technology meant it got a fairly poor reception. We were also expecting a bit more from these Southern Island codenamed parts, especially before we'd seen the Cayman-powered HD 69xx boards. Unfortunately, all the HD 6870 could claim to be was a re-engineered HD 5850. With the confusing nomenclature, we'd been thinking of something more like the HD 5870. At its heart, it was running the same technology as the Cypress-powered HD 58xx cards. In itself, Cypress was a quality GPU, but (unfortunately for AMD) was getting a bit long in the tooth for the modern-day market. However, with the drop in price to make it a more reasonable £166, the HD 6870 has begun to look like a more impressive card for the cash. It really does give the GTX 560 Ti more cause for concern, being cheaper and almost as quick, and that's just as true when you factor in CrossFire. With two of these Southern Island cards in unison, you're still saving almost £50 compared with a single GTX 580, will be nearing similar speeds and, in some cases, getting better performance. Again that Metro 2033 hi-res bench dropped it to completely unplayable levels, just scraping 2fps, but the pairing had the win across the rest of the suite. With just about everyone with a vaguely modern, standard-size mainboard able to put in a second AMD card in CrossFire, that makes this lower-end HD 6870 a rather interesting prospect in multi-GPU terms. It will also mean that anyone who already has one of these in their rigs isn't necessarily going to have to throw out the GPU with the bathwater. One little fly in the ointment, though, and an issue for pretty much all the cards down at this end of the spectrum, is that Sapphire is releasing the last hurrah of the HD 5850. 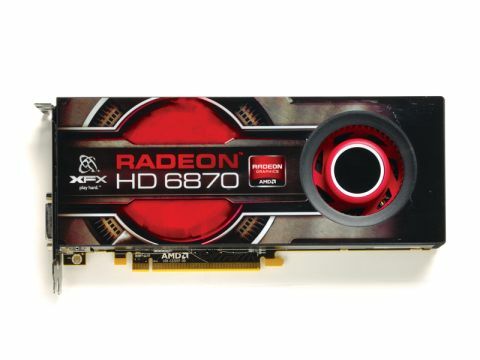 It's bought up AMD's stock of the Cypress PRO GPUs and is producing HD 5850s as a limited edition £100 card. You'll probably find them for a little more at retail, but a pair of these for just over £200 will give similar performance to a pair of HD 6870s, which are based on similar architecture. But they won't be around forever, and since the price drop, these HD 6870s have become much more impressive little graphics cards.